The first thing you’ll notice when you launch BricsCAD, after installing, is the Welcome window. Initially the Welcome window has only 3 tabs: Profile Presets, What’s New, and Tutorials. A fourth tab, Get Started, is added based on your profile selections. I’ll introduce you to these tabs from the bottom up. The Tutorials tab is what you would expect from the title and more! 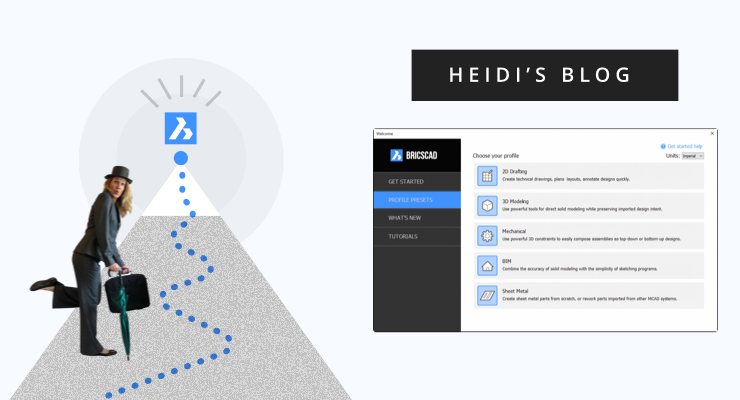 It’s a great resource whether you’re completely new to BricsCAD or a veteran user trying to advance your skills. 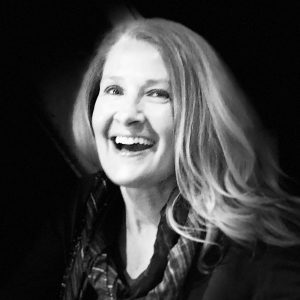 Scrolling through the Tutorials list you can select from a variety of categories including 2D drafting and Programming as well as industry-specific topics for BIM, mechanical and sheet metal design. Link to instructional blog posts in addition to more than 100 videos. 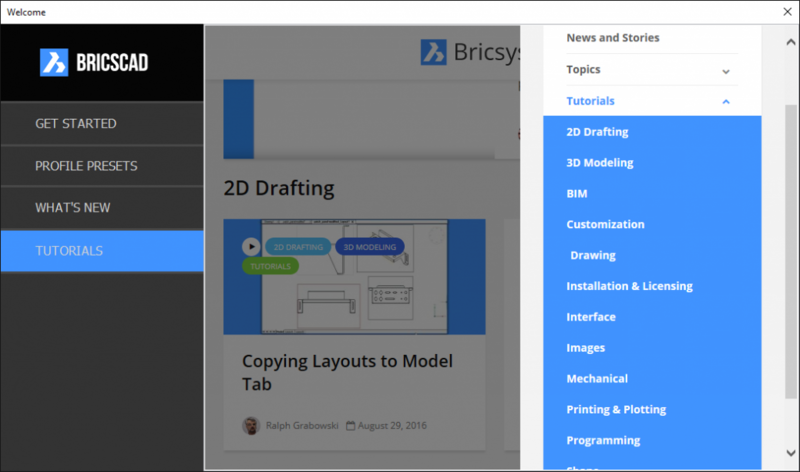 The Tutorials tab also provides easy access to the Bricsys website and other relevant topics and news. 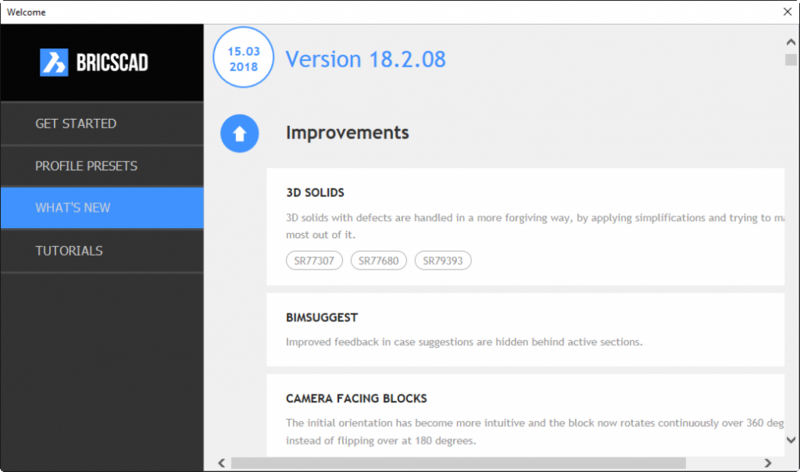 The What’s New tab offers important information about software fixes and improvements. If you’re like me, you greatly value Tutorials and Important stuff. But, when launching a new CAD application for the first time, you want to jump in and give it a try! This is where the Profile Presets tab comes in. The BricsCAD trial includes 5 preset profiles. First select the profile (2D drafting, 3D Modeling, Mechanical, BIM, or Sheet Metal) and the units (Imperial or Metric) you want to use. Then enter a name for the profile or accept the default profile name. Each time you select a Profile Preset, it’s added to the Get Started tab. The Get Started tab is just that! 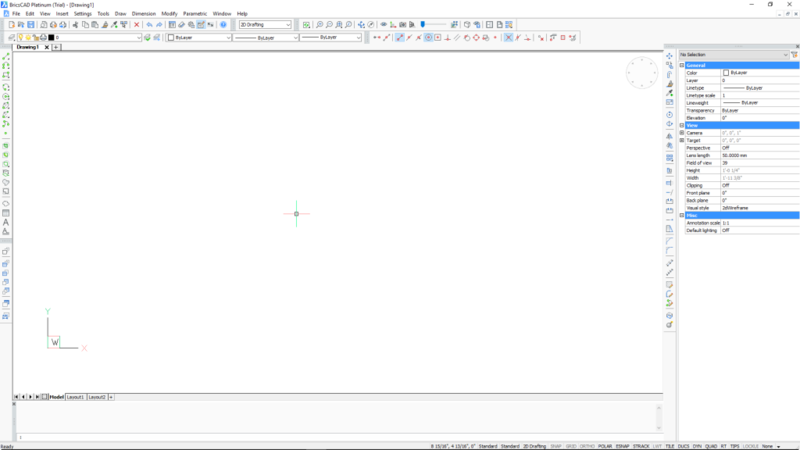 It’s where you launch into BricsCAD to start your design. First, at the bottom of the tab, set your current profile. Then, at the top of the tab, select one of the options to create or open a drawing. You can always change the profile, later, within BricsCAD. The Get Started tab is simply specifying which profile is used when it launches. If you’re joining me on this journey as a former AutoCAD user, you may prefer to skip the Welcome window in the future and simply launch BricsCAD like AutoCAD does by default. No Problem. Here’s how! 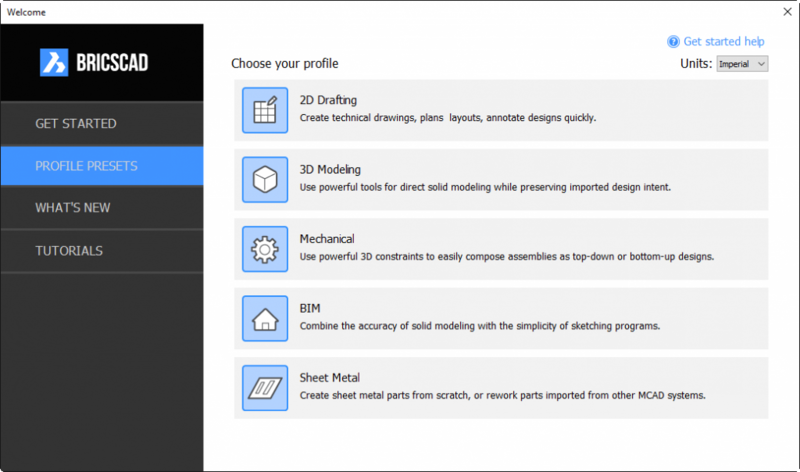 From the Profile Presets tab, choose 2D Drafting and choose Ok.
From the Get Started tab, set 2D Drafting as the current profile. Select the option in the lower right corner to turn off the Welcome window. 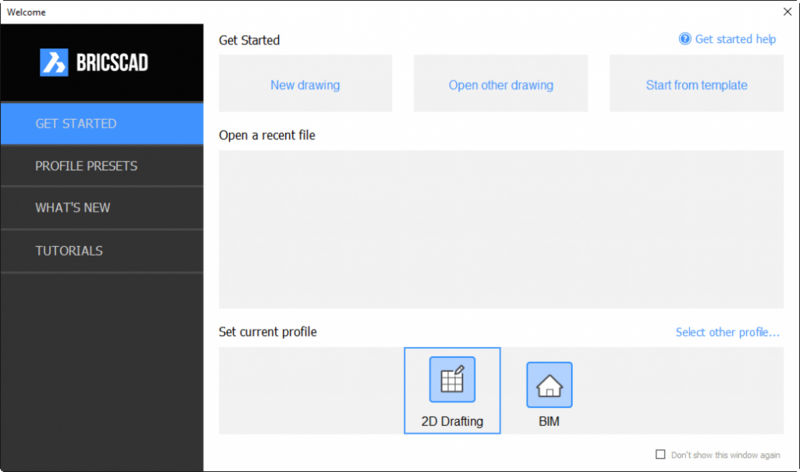 When you launch BricsCAD in the future, you go straight into the application using the default drawing template and with the 2D Drafting workspace active. Later, if you change your mind and want to restore the Welcome window, simply set the GETSTARTED system variable to On and relaunch BricsCAD. I hope you enjoyed your first glimpse of BricsCAD. There’s plenty more to come so please return for the next stop on my BricsCAD journey!